Each actuator is uniquely displayed on the PDA. Once the appropriate actuator is selected the LED on the actuator will flash blue. End-of-travel limit setting can be carried out automatically using the PDA auto setup wizard. During the setup wizard process, the CVA runs to the valve limit until it meets resistance, then backs off slightly and eases into the seat where the limit is then set, this is then repeated for the opposite direction. 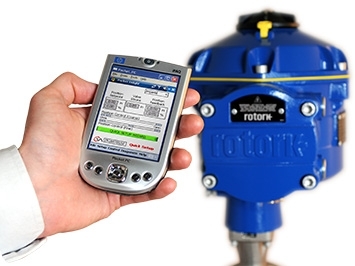 During the quick setup procedure you can select the load (thrust or torque) to be limited for the duration of the setup, after which this can be set to match the process or control valve requirements. During the setup the actual measure load will be displayed. After auto calibration the valve travel is shown on the PDA display.